LED arrays are quite popular and handy. You can make animated banners, panels displaying text or basic graphics. For a microcontroller turning a LED on and off isn't a problem. However if you would have 64 or more LEDs then it's not that easy. A solution for this problem are LED controllers. They reduce the number of pins needed to manage all the LEDs. Some of those controllers may also implement other features handy for text scrolling etc. In this article I'll showcase 8x8 LED array with MAX7219 controller. Described module can bought from dx.com and other Chinese sites, or from hobbycomponents.com and some other shops importing such electronics. This module can be connected with each other to create longer panels. The communication is done via SPI - Serial Peripheral Interface Bus. This allows us to control the whole LED array with just 3 pins (plus two for power). You can find Arduino or Raspberry code as well as various examples for this board or for the controller itself. There are also other boards using MAX7219 controller - it's quite popular. To connect this board to a microcontroller board we need to know which pins can handle SPI communication. For pyMCU the clock (SCK, SCLK) is digital pin 11, input (SDI/MISO) is pin 4, output (SDO, MOSI) is pin 5. The MAX7219 board has five pins: VCC (+), GND (-), DIN (to pin 5), CS (to pin 4) and CLK (to pin 11). 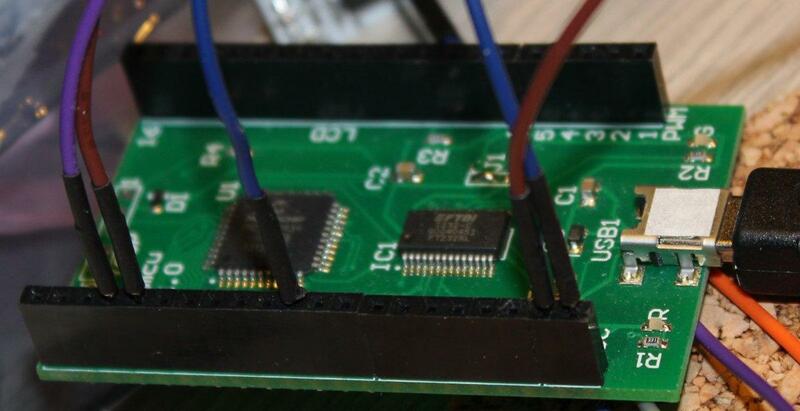 One board can be powered by pyMCU. Multiple boards will have to use their own power supply (5V, few amps). This board has also five upper pins for connecting multiple panels in longer chains. If we connect another board to the five top pins we will get two boards displaying the same thing. If we want to get a longer line then we have to connect all the SPI pins to the microcontroller except DIN pin. First board DIN pin goes to microcontroller, while next board DIN pin goes to DOUT pin (opposite pin on top of the board). There is an example on arduinobymyself.blogspot.com.br. There is a driver that can be used for that computer. For pyMCU I've forked it and modified to use pyMCU instead of Raspberry Pi SPI interface. The code works but it creates its own pyMCU instance, which may clash if you would want to control multiple devices at the same time. I'll try to refactor the code later to a class that can take a pyMCU instance as an argument. The arguments describe clock polarity, frequency as well as settings for data upload and download (check pyMCU module description for more details). Different boards can have various variations of SPI and I2C communications. This sometimes makes scripting such boards hard and annoying if no clear examples are given. Either so this board works and it's quite fun.